"A delicious way to add fruit into breakfast! Okay, it should probably serve 4 but if you have big eaters, don't be surprised if it is divided! Fortunately, you can put this together fast. Serve with vanilla yogurt." Melt butter in a cast-iron skillet in the preheating oven. Combine peach slices, brown sugar, and cinnamon in a bowl; gently toss to coat the peaches well. 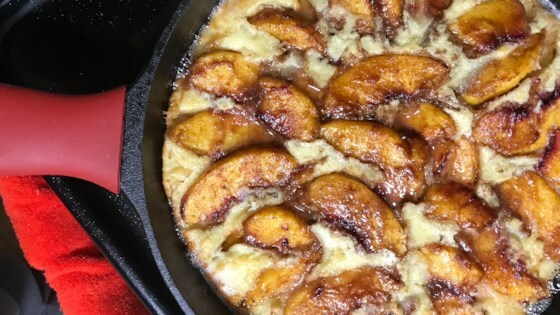 Beat eggs, milk, flour, vanilla extract, salt, and nutmeg together in a bowl until batter well-combined but a little lumpy; pour into skillet. Top batter with the peach mixture. Bake in preheated oven until set in the middle, about 20 minutes. Delicious! I used canned peaches as that was all I had (just drained them and dried them with paper towel) and it turned out great. My 2 year old gobbled it up. Made it according to the recipe and it came out great. This made the house smell wonderful while it was cooking. I didn't actually try this but my son liked it. He didn't use yogurt but just drizzled maple syrup over it.